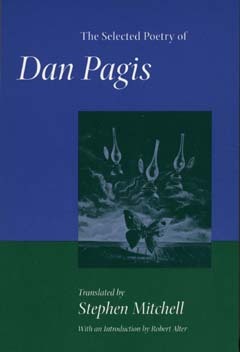 Dan Pagis (1930-1986) spent three of his adolescent years in a Nazi camp before arriving in Palestine in 1946. He became one of the most vibrant voices in modern Israeli poetry and is considered a major world poet of his generation. A master scholar of Hebrew literature, Pagis drew fully on classical texts and infused his poetry with a centuries-old mysticism. Yet he also brought an immediacy and colloquialism to Hebrew poetry. In these superbly translated poems, Dan Pagis's voice can be heard celebrating the human spirit. Stephen Mitchell's numerous translations include The Book of Job, A Book of Psalms, and Genesis. Robert Alter is Professor of Comparative Literature at the University of California, Berkeley, and author of The Art of Biblical Narrative (1987).